Income inequality has become a major issue in the presidential campaign. A recent Pew Research Center poll, for example, attracted wide attention when it found that as many as 66% of Americans believe there are “very strong” or “strong” conflicts between the rich and the poor, an increase of 19 percentage points since 2009. But while Americans are hearing more about class conflict, there is no sense that the American people are on the verge of class conflict; they just want a better chance of achieving success themselves. They want government policies that give everyone a fair shot, reflecting bedrock American belief in the individual’s ability to succeed through hard work. A recent Gallup poll found 70% saying that it is extremely or very important that the federal government in Washington enact policies that increase the equality of opportunity for people to get ahead. By comparison, just 46% say it is extremely or very important for the government to reduce the income and wealth gap between the rich and poor; 54% say this is somewhat important or not important. Income inequality is an element of the economic system that is accepted by many Americans: 52% say the fact that some people in the U.S. are rich and others are poor is an acceptable part of our economic system. A sense of economic inequality is hardly new. A broad majority public (77%) says that there is too much power in the hands of a few rich people and large corporations; and as far back as 1941, Gallup polling found a majority (60%) expressing this view. In addition, the public agrees with the statement that in general the rich just get richer while the poor get poorer –majorities have consistently said this since Pew Research first asked the question in 1987. At root, these concerns are associated with the issue of economic fairness. 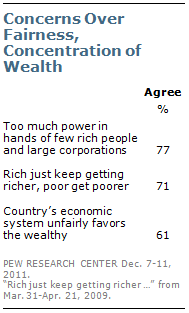 About six-in-ten (61%) say the economic system in this country unfairly favors the wealthy. 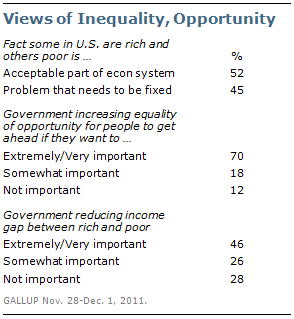 Far fewer say that the economic system is generally fair to most Americans (36%). Concerns over economic fairness can also be seen in the public’s negative reactions to government policies such as the bank bailout. A Pew Research Center survey in February found that 39% say that the 2008 loans to banks and financial institutions were the right thing to do; 52% say they were the wrong thing. 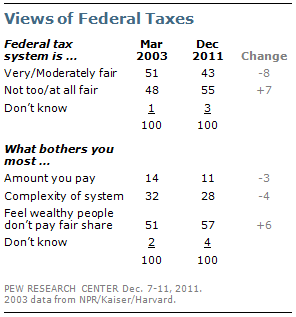 The public’s desire for fairness in government policy is perhaps best seen in views of the tax system. A majority of Americans now say the federal tax system is unfair and there has been a seven-point rise in this view since 2003.The public’s top complaint about taxes is not how much they themselves pay; rather, it is the belief that some wealthy people don’t pay their fair share. Nearly six-in-ten (57%) say what bothers them most about taxes is the feeling that some wealthy don’t pay their fair share, just 11% say it is the amount they themselves pay. The public supports overhauling the federal tax system and this support stems primarily from concerns over the fairness of the system. A desire for a level economic playing field is tied to American individualism. Belief in the individual’s ability to achieve success through hard work is a bedrock American value. And there is a strong belief that the individual has the power to shape their own future. Three-quarters (75%) agree with the statement that everyone has it in their own power to succeed; just 19% say success is determined by outside forces. This view has been held by wide majorities ever since the question was first asked in 1994. A majority of the public (58%) also agrees with the statement that most people who want to get ahead can make it if they’re willing to work hard. However, public views of opportunity are not immune to hard economic times – agreement with this statement has slipped somewhat in recent years. But there is no less admiration for people who get rich by working hard: 90% agree with this sentiment, just 8% disagree. This near-unanimous opinion highlights that the public’s fundamental complaint is not with the rich themselves. Pew Global Attitudes surveys have consistently found that Americans’ views of the individual and role of the state set them apart from the publics of many Western European nations. Nearly six-in-ten Americans (58%) say it is more important that everyone be free to pursue their life’s goals without interference from the state; far fewer (35%) say it is more important that the state play an active role in society so as to guarantee that nobody is in need. The balance of opinion is reversed among Western European countries. In Spain, for example, 67% say the state guaranteeing that no one is in need is more important, just 30% say individual freedom to pursue goals should be prioritized. Similarly, asked if they agree that “success in life is pretty much determined by forces outside our control,” most Americans disagree. Opinion is much more mixed among Western European nations. For example, 57% of the French and 72% of Germans say that success in life is determined by outside forces. Americans’ more skeptical view of a strong social safety net has consequences. About a third of Americans (32%) say there have been times in the past year when they have been unable to afford health care, which is consistent with Pew Research Center surveys over the past decade. That is far higher than the percentages in four Western European countries who say this. 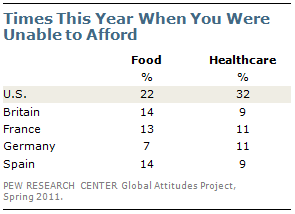 People in the United States also are more likely to say they have been unable to afford food in the past year.